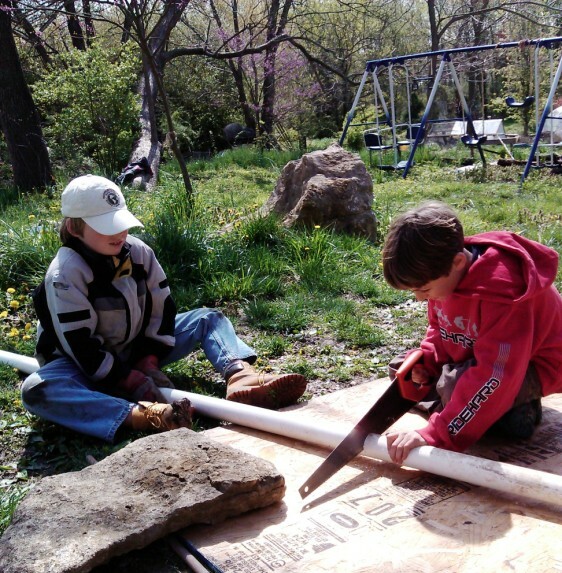 Recently I spent a day with a Bloomington, IN homeschooling cooperative. Two families work together on homesteading projects on each others’ land. This allows their four children, ages 8 to 12, to learn by doing—while increasing their confidence and skills. 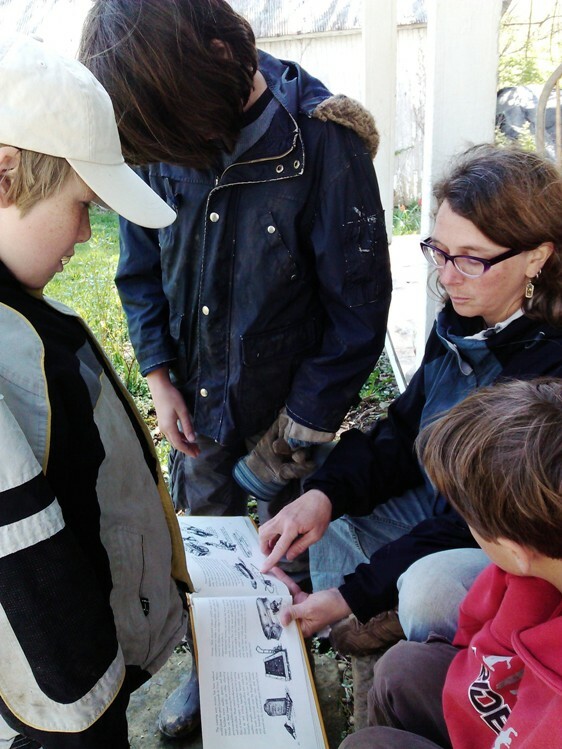 Projects range from seed saving to bike maintenance to creation of a family almanac. They’ve gone mushroom hunting, practiced knot skills, and (on rainy days) learned knitting and mending. They’re working on a fire pit and hoping to build a treehouse. 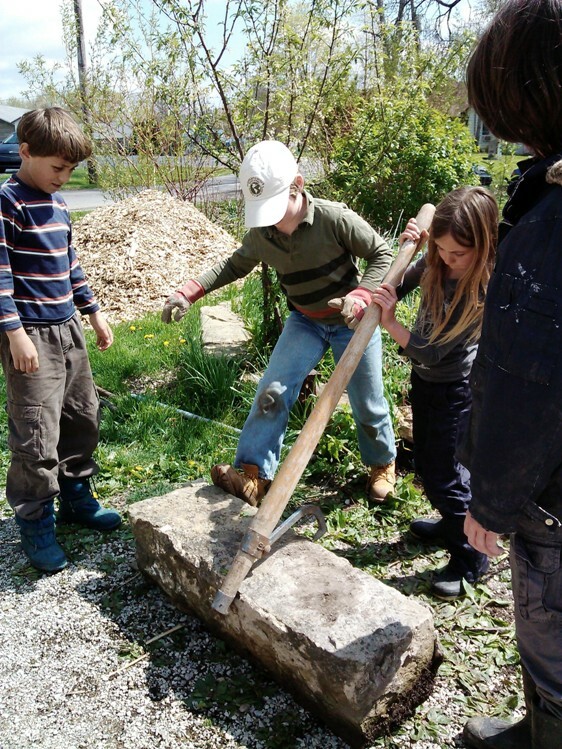 The day I was there, the students were studying how to move a heavy sandstone block down a sloping driveway from the front yard to the back. They were to place it into a rectangular hole in the dirt, forming part of an herb garden’s perimeter. The emphasis was on problem solving, collaborative effort, and applying their study of friction and levers. This was no small task and involved an array of tools, including something I’d never heard of called a cant hook. The mom/teachers, Stacey and Dani, encouraged them to try out every idea and see what worked best. The kids worked by experimentation, reasoning, puzzling, trying, and talking—displaying remarkable tenacity through the whole process. There was not one temper tantrum. I could see that the communication skills these kids develop through group projects will go a long way toward smoothing their way in the world—while also contributing to the healing of that same world. By the end of my visit, the children had moved one monstrously heavy block into place in the back yard, where it will begin the delineation of an herb spiral. There was great cheering when the block was finally nestled into place. As results-oriented as we are these days, this may not seem like much for several hours’ work. But in the process, they learned to learn, to cooperate, and to not fear failure. Watching them, I wondered how my life would be different if I had had these sorts of experiences in my own childhood. I might consider myself in a different light now. I might be handy, of all things. At the very least I would be braver, less fearful of being wrong. 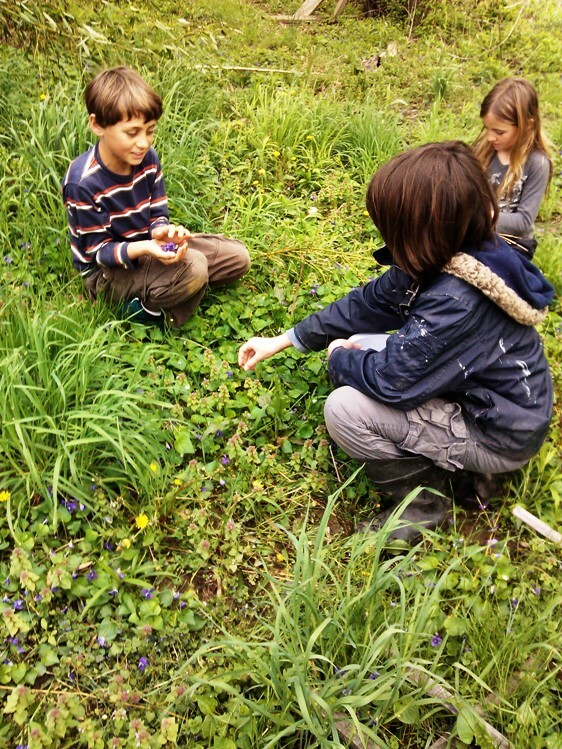 This entry was posted in Education, Homesteading and tagged Alternative schools, Communication skills, Cooperatives, DIWO, Do-it-with-others, Garden, Homeschooling, resilience, Small but Mighty, Sustainability. Bookmark the permalink. Tee hee! They are going to get some brawn in for the rest of the job I think, and/or do it gradually over time.